Fletcher and Fletchie are obious names. It was about his personality. I have known lots of dogs who chase balsl, fetch sticks, the usual. Fletchie is the only dog I have known that modified play and invented his own games. Every morning before work, my wife and I would sit on the floor and roll the ball on the floor between us in a game of keep away. Fletch would try to get the ball. Of course, after awhile, he got the hang of it and got the ball. He would drop it, and we would play again. As his skills increased, we bounced the ball. Finally, we would toss the ball. He was very hard to beat. One day he caught the ball, walked over in front of me and dribbled it. When i reached for it he would yank it away. Fletchie was playing keep away. One evening we were reading, and we heard the tennis ball ricocheting off the walls. We looked at each other puzzled. In the other room, Fletch was using his paws to bat the tennis ball against the wall and then catching it. We got an oversized tennis ball which was about the size kids use in the game 4 square. He batted it with his paws, pushed it around with his snout, then stopped and looked at it. Then he pounced on it with his front paws causing it to come up off the floor. With each pounce he got it higher till he got it high enough to stand on his hind legs and bat it at us with his front paws. 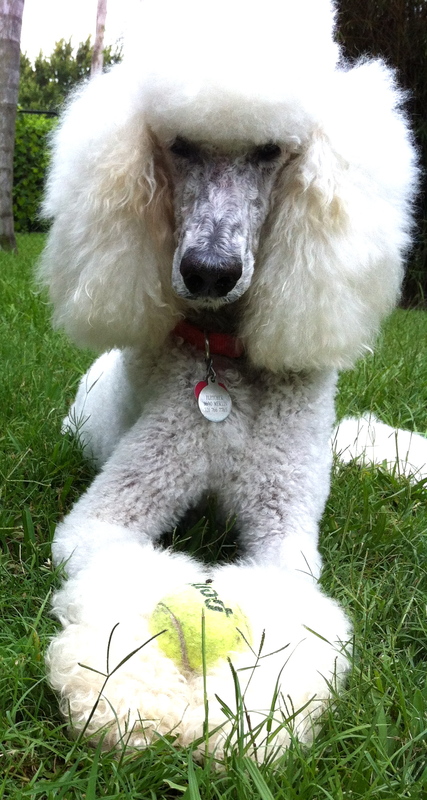 Fletchie loved tennis balls. Most of the time he carried one in his mouth even on a walk. Slometimes he would dribble it. Other times he would squeeze it between his jaws. His favorite game we called “READY”. We had half a dozen ball which we would bounce on the sidewalk in different directions — left, right, straight, high, low. As soon as a ball was caught another ball was thrown in a different direction. It was very seldom that he didn’t catch all the balls. He loved the challenge. When play was finished he would lay in front of us with his tennis ball resting on his front paws. In the end we had to really slow “Ready” down. He had a heart condition and arthritis in his spine.